I blogged a while ago (on my random mescaline-addled blogspot) about inspirations that have guided my writing--and within that is not just my fantasy work, but my YA sci-fi story currently pending its sequel. The blog noted the key influence of comics in my style, focusing particularly on the work of John Byrne. But if I had to cite one key formative step in my writing there is no doubt that it would be role playing games, and of them all (and believe me I played almost all of them in the Eighties) it has to be Dungeons and Dragons. This will come as no surprise to those who read my work, and indeed the influence of DnD can be seen in many top fantasy authors currently. This is a strange full circle: fantasy books inspiring a game, a game engaging and inspiring potential authors, who then write fantasy! I first observed the DnD phenomenon via my mate Nick Earnshaw's brothers' piles of DnD stuff. They were placed around his house, in little piles, under tables and cabinets- enticing mounds of graph paper, funny dice, rule books and modules. This was in c1981 and thus we are talking old school first edition AD&D here. I properly got into it when (a) I started on the Fighting Fantasy books and (b) got intrigued by The Hobbit and Lord of the Rings. Ralph Bakshi had released a cartoon of LOTR and I recall seeing a recovered LOTR book at my mate's house (and indeed, we later played Middle Earth RPG). I started, as many did, on Basic D&D, moving onto Expert and from that, Advanced. I spent my life savings (about £30) on the Dungeon Masters Guide and the Players Handbook, doing without the Monster Manual for year or so (creating many odd interpretations of the monsters found in that big table in the appendix of the DMG). And the creativity began. We played a lot of the modules at first: The Giant and the Drow ones (G1-3, D1-3, Q1) I ran with my younger brother. We played White Plume Mountain about ten times over (how cool was Black Razor? Like bloody Storm Bringer), Tomb of Horrors, one of the A ones (I forget which) and... as time went on, and the adventures got cooler, the UK modules and Dragonlance (and of course, Ravenloft). But the real fun in the game was the real creativity--the writing of my own adventures, the generation of a campaign. 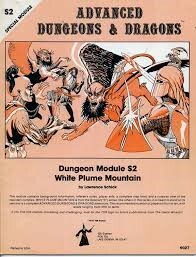 Although through the Eighties we played dozens of other RPGs (Runequest, Traveller, Star Frontiers, Gamma World, Call of Cthulhu, Paranoia, Dr Who, Star Trek, MERPG, Toon, Judge Dredd, Bushido, Marvel Superheroes, Villians and Vigilantes, the time travel one, a gangster one too....) DnD was always my favourite. What we created changed with our tastes, or maturity and our outside influences. In the beginning it was daft, far-fetched, almost cartoonish--I recall a repeat-action crossbow that we loved in Hawk The Slayer, that half the characters had. Later we would weave together intricate campaigns, with fully realised histories. 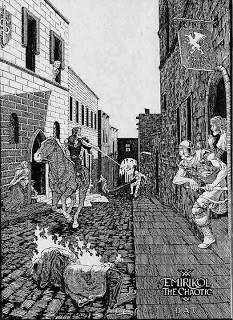 I was never one for using TSRs campaign worlds (Greyhawk, Forgotten Realms) although when I ran a campaign in 1988-1991 I used the Fighting Fantasy sourcebook Titan as the basis for the adventures. But the story became personal, almost like a soap opera, with marriages, kids, relationships. old family feuds, arch-enemies and recurrent villains. Like a story, like a RPG should be. Then I hit medical school, and we all moved apart in the country. Bar one or two sessions we all accepted that we'd not play again and, when wives and kids arrived, it seemed even less likely. Around 8 years ago, bored one evening, I began to write a quick story about the characters we used to play with. I e-mailed it out to the guys and they loved it, and so I began to write a story as if we were playing the adventures again, with all the references to the characters histories. It felt great, creating once more, breathing life into dialogue and action. The 300 pages the story ran to taught me a huge amount about writing, about structure. As it was concluding one of my mates, Ant, commented that I should tackle something brand new... something not related to our prior campaign. So it began with a map... and now it’s a six book saga, which I’ve finally finished over a six year period. It took a while to escape the complete DnD influence. The first draft was very DnD style, with the magic derivative, and the characters almost having classes and levels! It took a bit of discipline and merciless use of the Red Pen of Sorrow +1 to tame the bias in the text. I’m not alone in this. There are a dozen famous fantasy authors whose work is heavily influenced by DnD: Erikson, Scott Lynch, Parick Rothfuss, Saladin Ahmed, Peter Brett, China Meville, and George RR Martin. The influence has drifted out to literary circles beyond fantasy, including Stephen Colbert, and Junot Diaz. 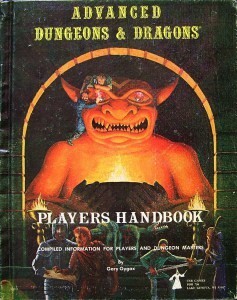 In many ways the playing of DnD emulates that of the traditional storyteller, sat around a campfire, with the added influence of improvised theatre thrown into the mix, and despite the rise of computer role playing systems and the internet it remains a popular outlet for creativity and expression some four decades after its inception. Ross M Kitson, features writer. Ross is a doctor, occasional blogger, full time geek, and sporadic author of fantasy and YA sci-fi. Connect with Ross on Twitter. Thanks Christoph. Ironically the series Stranger Things has given the hobby quite a boost in attention, and a renewed interest in kids wanting more than an on-line RPG experience. Authors can find inspiration in so many places! Keeping in touch with gaming trends can also indicate what our audience wants in a novel. Much of the epic fantasy that is hitting the screens (Shannara, Amber) has strong links with DnD in my mind. For the YA audience, gaming is a big influence for the tricky male audience. I really enjoy your blog! There's always something new to learn. Thanks! LOL- thank you. Great to have an outlet for my geekiness! Never played D&D but love the concepts. To me it was the link between a game and creativity, without constraint on what we designed. Very cool link to fiction and games, both of which are imagination/ fantasy!